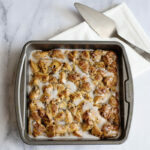 Cinnamon Roll French Toast Casserole gives you the best flavor combination of cinnamon rolls and french toast. With just a few ingredients you can whip up this easy and delicious recipe. I am a cinnamon roll addict and I love all types of cinnamon rolls! I could eat them for breakfast every morning and never get tired of them. Everything from the Pillsbury cinnamon rolls (the large flaky ones are my favorite) to the ones from our local bakery to some delicious homemade cinnamon rolls. They are all good. And they must have extra icing. You can never have too much icing. 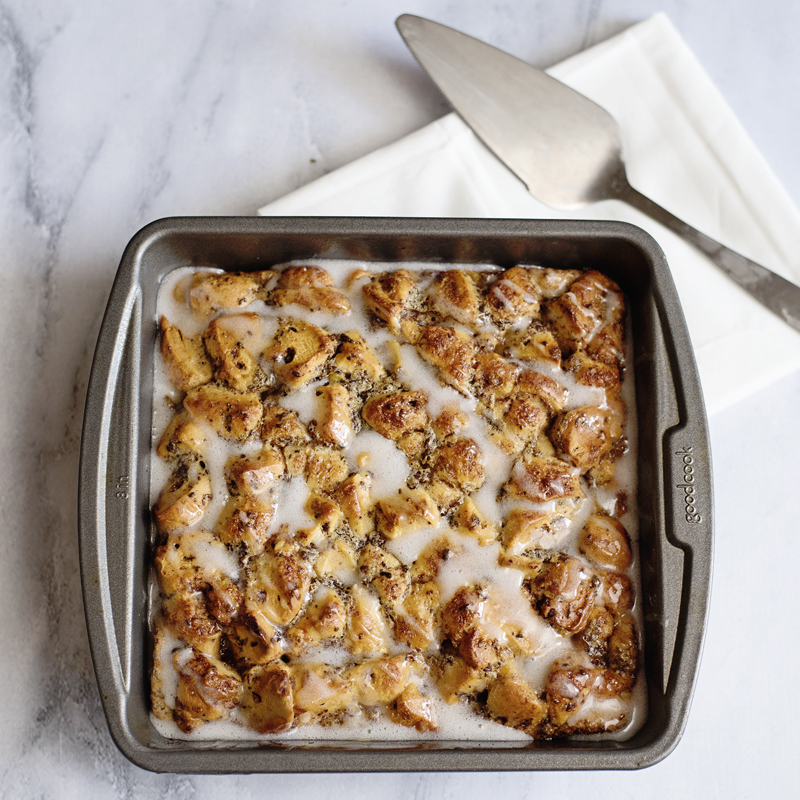 This Cinnamon Roll French Toast Casserole combines two of my favorites, cinnamon rolls and french toast. It’s a must try recipe! 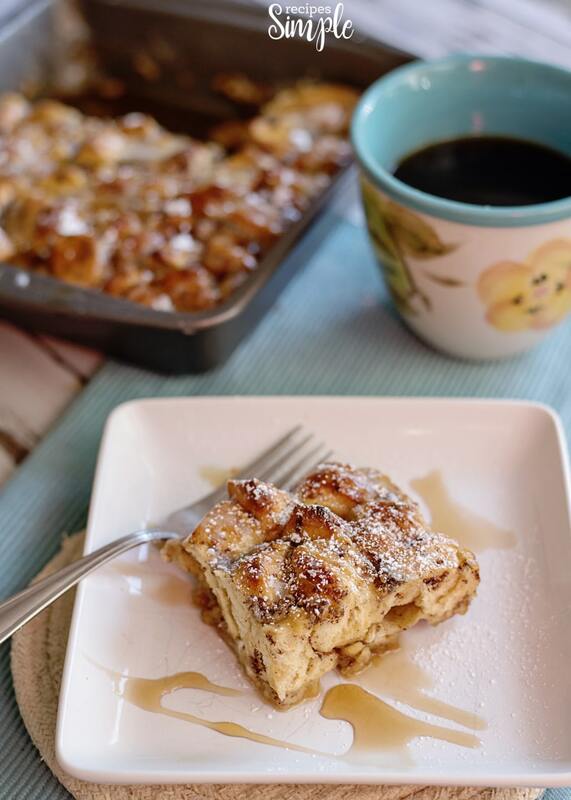 Cinnamon Roll French Toast Casserole gives you the convenience of using store bought refrigerated cinnamon rolls plus a few more ingredients to make a quick and tasty french toast bake that everyone will love. This recipe is great for a weekend breakfast or brunch or a special holiday breakfast treat. Your house will smell amazing while it’s cooking. Preheat oven to 375 degrees and lightly spray a 8×8 baking pan. 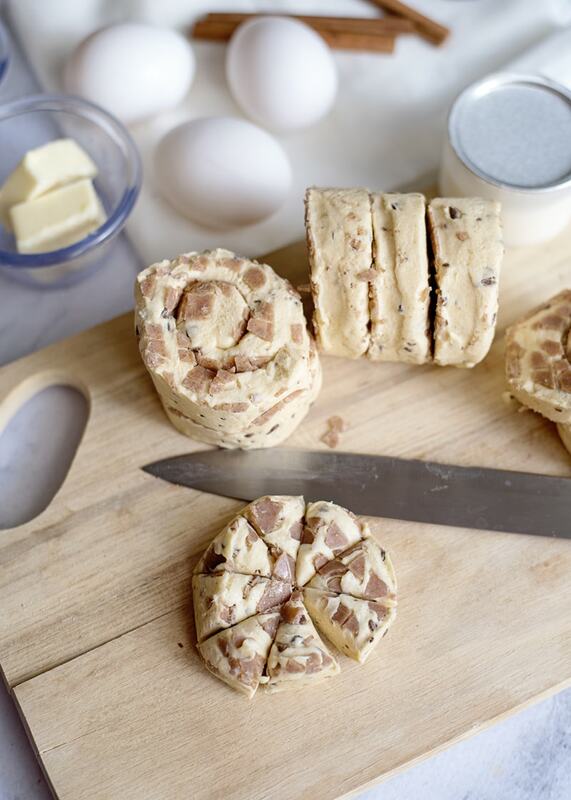 Start by separating the cinnamon rolls and slicing each roll into 8 pieces. Set the icing to the side. 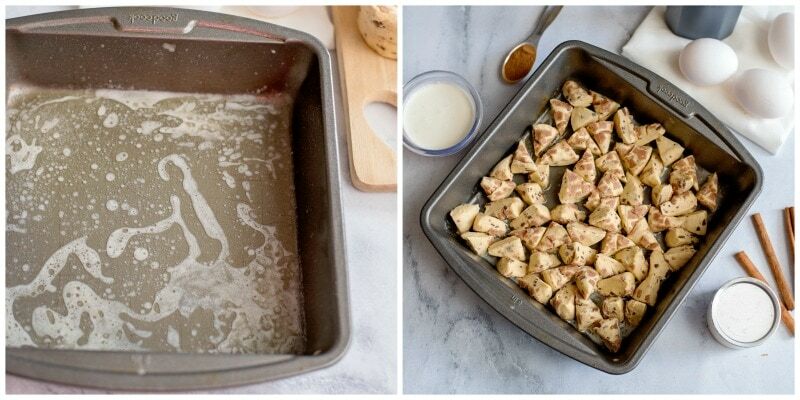 Melt the butter and pour it into the bottom of your 8×8 pan. Arrange the cinnamon roll slices all over the butter layer. In a small bowl, beat together the eggs, heavy cream, cinnamon and vanilla until well combined. Pour over the top of the cinnamon rolls in the dish. Then drizzle the maple syrup all over the top. Bake for 20-25 minutes, until top is golden brown. Let it cool for a few minutes before serving. Enjoy! Remove the metal lid from the icing container and microwave the icing for 5-10 seconds, until it’s thin enough to drizzle. Pour the icing all over the top. 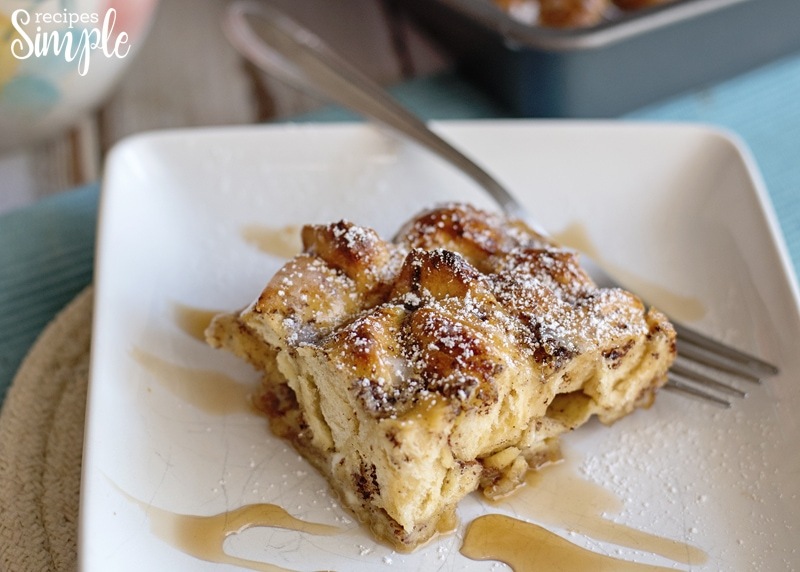 Cinnamon Roll French Toast Casserole is best served warm with a little extra syrup and powdered sugar. 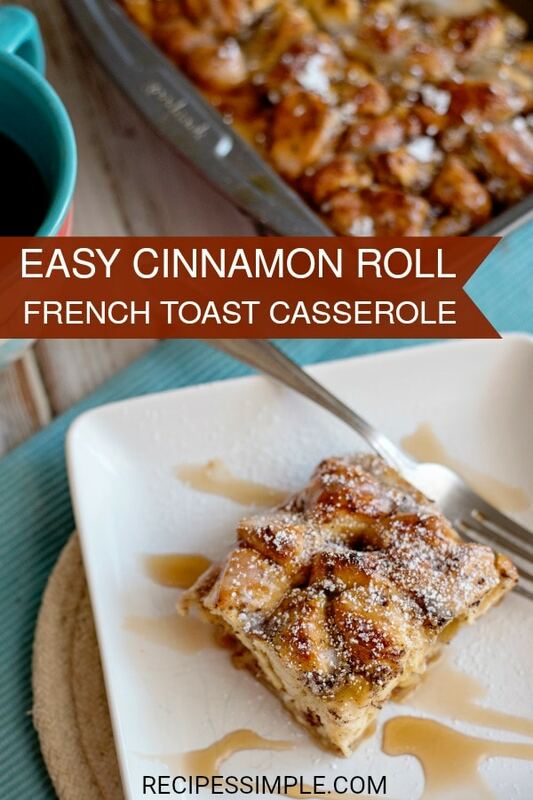 I hope you enjoy this Easy Cinnamon Roll French Toast Casserole. 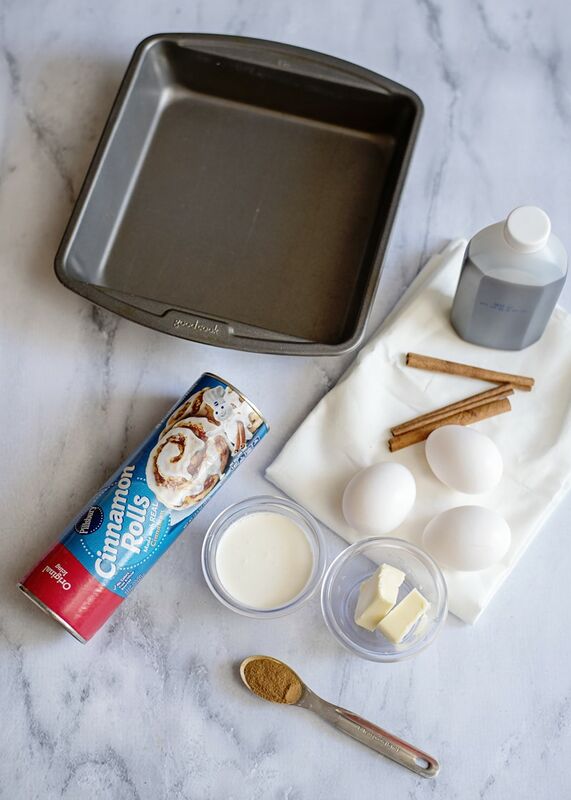 Cinnamon Roll French Toast Casserole gives you the best flavor combination of cinnamon rolls and french toast. Bake for 20-25 minutes, until top is golden brown. Let it cool for a few minutes before serving.